Fitch Fuel Company, Inc. is a 5th generation family owned and operated fuel company that is nearly 100 years old. What started as an ice and coal business has grown into a full service fuel, propane, plumbing and heating company. They are located in beautiful northern New Hampshire and pride themselves as a company that puts customer service and quality work first. 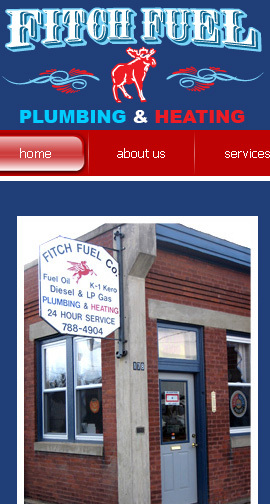 I worked on the Fitch Fuel website with business manager, Chris Foss. He said it was important that it was "Fitch Fuel blue," included the company trucks and the moose in the logo. It was critical to Chris that there was a strong brand presence on the site. I worked with a graphic designer, Michelle Moe, to create some mockups until Chris settled on the current set up. I helped Chris register the domain through GoDaddy and used DreamHost as the hosting service. I registered his new website on Google Apps for domains which allows him to have the "@fitchfuel.com" on all the email addresses for the company but actually go through Gmail. There are two forms on the site, one for resumes and one for contact. I created an administrative backend for Chris to be able to change certain content on the site himself; things like oil prices that have to be updated every day. I also set up Google Analytics so they can track who is visiting their site.